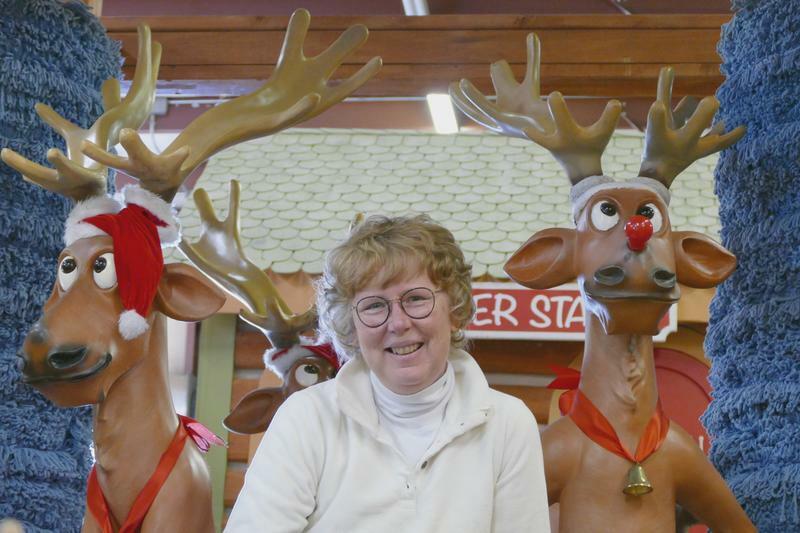 Once a designer for theme parks, Karen Sells now creates fantastical floats for the Novant Health Thanksgiving Day Parade in Charlotte. On a recent afternoon, inside a bustling, 8,000 square foot warehouse off Remount Road, workers are carrying out their final preparations for this year's Thanksgiving Day Parade. On one end of the warehouse, workers are testing a life-size locomotive that's spewing steam from its smokestack. On the other end, a painter is doing detail work on Santa's workshop. The oversized, vibrantly-colored vignettes came here straight from the imagination of Karen Sells, a rather quiet woman in a plain white turtleneck and round glasses, who's designed the last five Thanksgiving Day parades and was recently promoted to art director. Sells grew up the daughter of an electrical engineer and a home ec teacher, and she says as a child, she never had an overwhelming interest in parades. "I mean I always watched them. They were cool," she said. But she had her eye on other forms of design. In college, she studied interior design and met her now-husband, an architect. The two ended up settling in Charlotte in the early 90s and worked together with Kings productions, which then owned Carowinds theme park. "I was doing signs and merchandise and building colors and all of that kind of stuff," Sells said, "The people that I've known in that business, either you love it and you can't stop, or you don't last very long." Even after she had a son and left her theme park job, she still kept a side business as a freelance designer, never giving up on her calling - though it often meant working in the corporate world designing logos, which she found uninspiring. "I find it harder to stay in those confines," she said, adding with a laugh, "It's just boring to me." Then, in 2013, she got a call from one of her old co-workers from the theme park biz: Robert Krumbine, now working with Charlotte Center City Partners. The organization was taking over operation of the annual Thanksgiving Day parade, and Krumbine wanted Sells to help him elevate its production value. He says hiring her was a great decision. "You've got to have a good team. You've got to have people that leave the ego at the door, and come in and work hard," Krumbine said, "And Karen - she just cares so much about this parade. She's kind of on the same page as I am." Krumbine and Sells work together on the parade in a collaborative spirit, with Krumbine thinking up grand concepts, and Sells fleshing them out on paper and figuring out ways to turn them into reality. "While we're talking about it, I start to get pictures in my head," Sells said, "Sometimes it comes quickly. Sometimes it doesn't." This year, the two have put together an impressive assemblage. There are around 70 original elements, including a life-size gingerbread house, a giant oven popping out cookies, and a 24-foot toy marionette - all whipped together on a budget of $500,000 and with a skeleton crew of about nine people. As for the big day, Sells says she'll be getting up early to spot check the floats - make sure all the tinsel is in the right place, then she'll likely head home. "I hate to say this, but I've only been to the parade once, and that was the first year I was here," she said. Why not stick around to see her work in action? "I've seen it," she said with a laugh, "I know it intimately." And so instead, she'll be heading home to ready Thanksgiving dinner with her husband and her son's dog, whom she's pet-sitting this year. Then she'll get to kick her feet up for a bit, until next May, when she'll be back to do it all over again.